I had to do it, to go back to the scene of the crime. So once I got back to my parents country Michigan home, I walked past the gunfire, through the poison ivy, and thorny arcs of raspberry bushes silently waiting to make contact with skin. I tramped downhill, through fields, then through the swarms of mosquitos to put it up—my new hammock. The location: over the same creek where my last hammock broke and dumped me into the muddy water. ENO hammocks don’t break, but mine just so happen to...because I let it. My previous one had eight years of wear and tear and had recently developed a couple tiny holes. Unchecked, they corporately provided a lack of structural integrity that ripped under the pressure of my body and dumped it into the idyllic creek. If I had done simple maintenance, the spill would have been prevented. So, on this new day, it wasn’t as much a question of whether my brand new ENO hammock was going to hold over the creek, it was simply an issue of me needing a moral victory. It was one that was worth the thorns in my legs, the mosquito bites on my face, and the bullets ringing out over the hill an eighth of a mile away. Because the fault was mine in not fixing my hammock, so the onus was on me to rectify it. And walking back up to the house to my worried parents, donning fresh mosquito bites and scratched legs, I had a smile on my face. 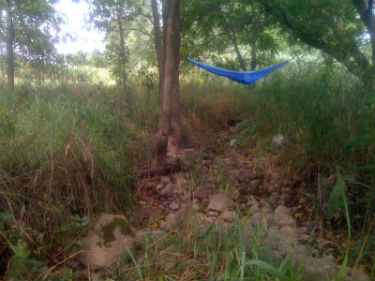 Because the hammock held, and that day, I conquered the creek, and was thus acquitted of my crime. It sure felt good to be free.